Workers at the Jet Propulsion Laboratory prepare the spacecraft for transfer to the launch pad in a protective canister. 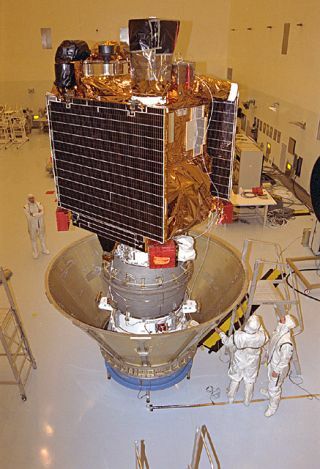 In this historic photo from the U.S. space agency, Jet Propulsion Laboratory (JPL) workers in the Payload Hazardous Servicing Facility (PHSF) prepare the Mars Global Surveyor spacecraft for transfer to the launch pad by placing it in a protective canister on Oct. 21, 1996. The Surveyor spacecraft (upper) is already mated to its solid propellant upper stage booster (lower), which is actually the third stage of the Delta II expendable launch vehicle that will propel the spacecraft on its interplanetary journey to the Red Planet. Once at Launch Pad 17A on Cape Canaveral Air Station, the spacecraft and booster assembly will be stacked atop the Delta vehicle. The Surveyor is slated for liftoff on Nov. 6, 1996 at the beginning of a 20 day launch period.